Ah, bookshelves... great for storage but can look disastrous rather quickly. And, they're usually really tall or wide so there's no hiding them! 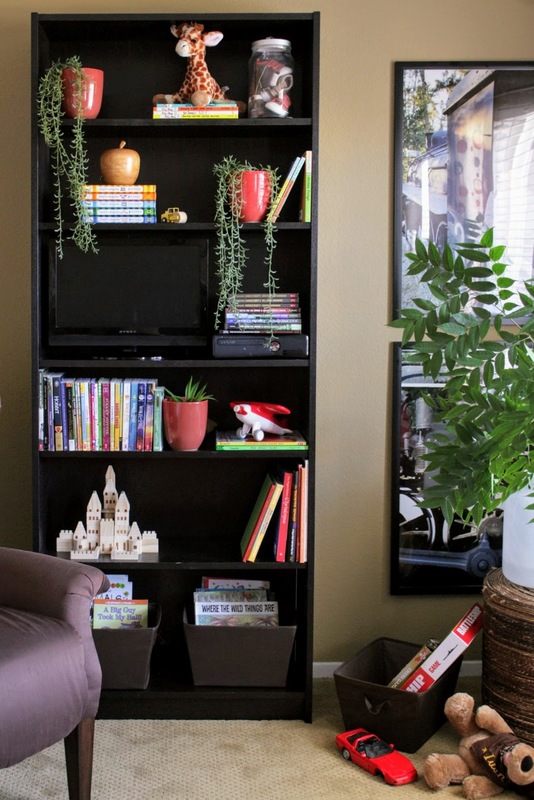 Some bookshelves are used for decorative purposes only and those are a little easier to style. But most of the time bookshelves are "utilitarian" and those suckers are jam-packed with books, electronics, DVD's, toys and all sorts of other stuff. 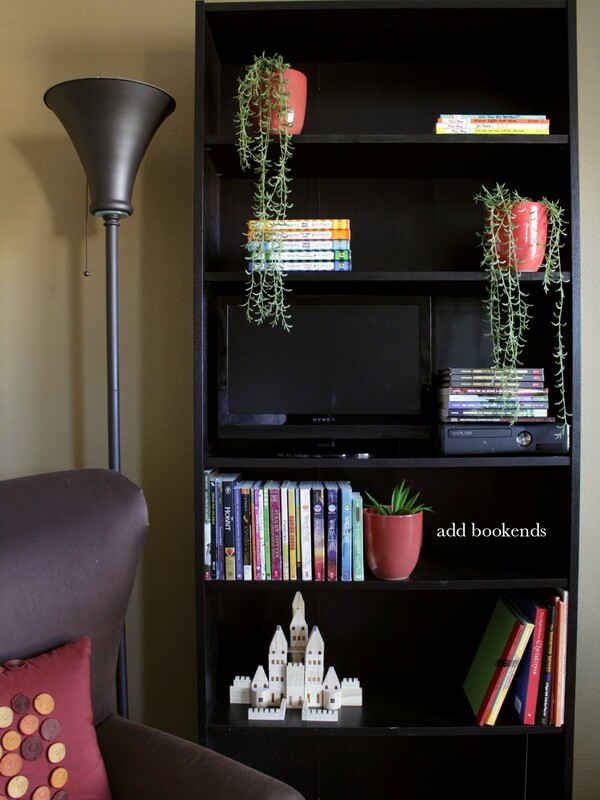 But even the bookshelves that are heavily used for storage can look styled, clean and organized. Trust. My son's room (work in progress)... actually let me rephrase that. It's not a work in progress. "Progress" means I am taking strides to make something better. And, I'm not. 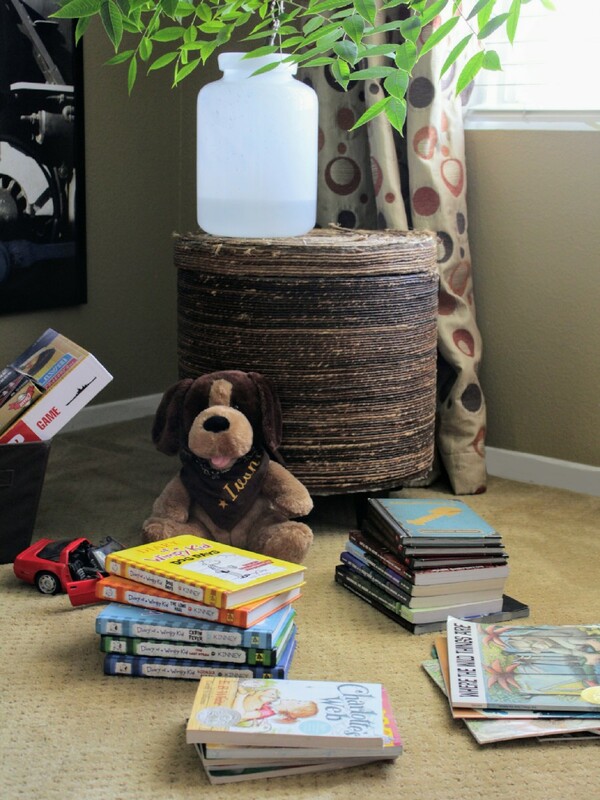 My son's room hasn't changed since the day I created it for him during my wife's pregnancy... seven years ago. And I haven't had the inspiration to change it. BUT that doesn't mean it can't look pulled together. ANYWAY as I was saying, my son's room has a "utilitarian" type of bookshelf that houses books, toys, a TV and his XBox. Some of that stuff ain't really pretty to look at (like the XBox and the TV) but they need to be there so I gotta make it look decent AND I want to share with you how I did that because I'm sure I'm not the only one who wants their bookshelves to look good! clear your shelves. Group similar items together. 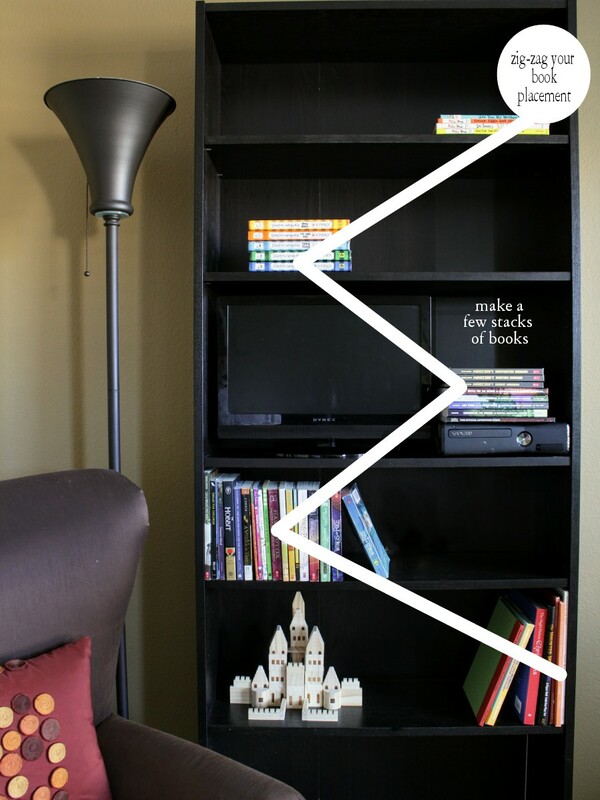 Separate your books by hardcovers, paperbacks, thin books, over-sized books and even by series and size. You don't have to have all your books standing up. Lean a few here and there and make a couple of stacks on some shelves. 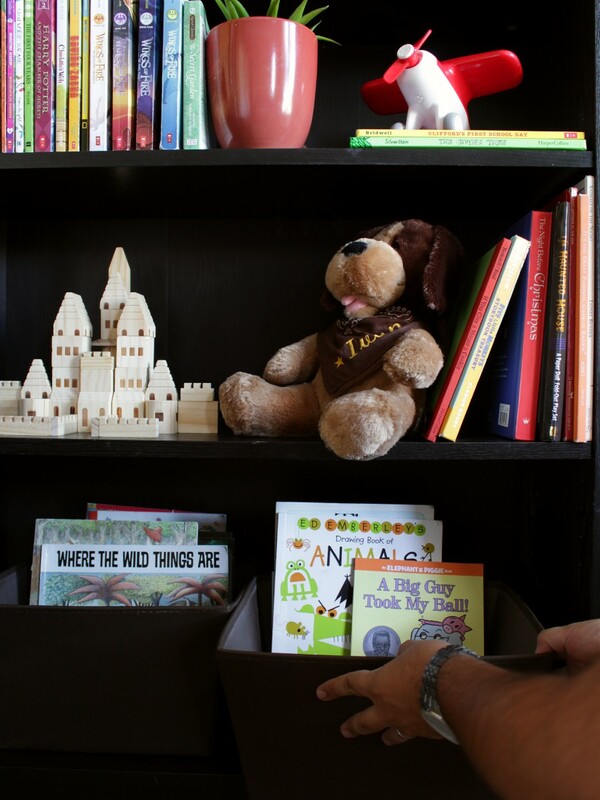 If you have those thin, children's books or magazines then throw those in a nice box or basket that fits inside the shelf. They don't HAVE to be "official bookends." I used some pots I kept from the orchids I bought at Trader Joe's. 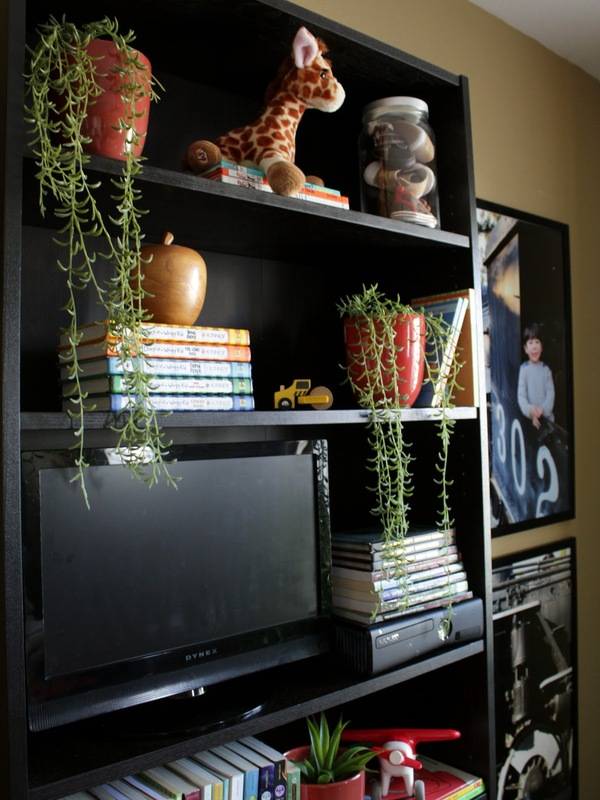 I stuffed them with some faux plants just to give the shelf some freshness and life. You're probably thinking "Oscar, how can a plastic plant add freshness and life?" Well, let me tell you. If you know me, then you know that any plant my hands touch will probably die. There's NO way that a plant on this shelf will be an exception. So, I figured a green, plastic plant will give more life and freshness than a dead, brown and withered plant. This is the fun part! 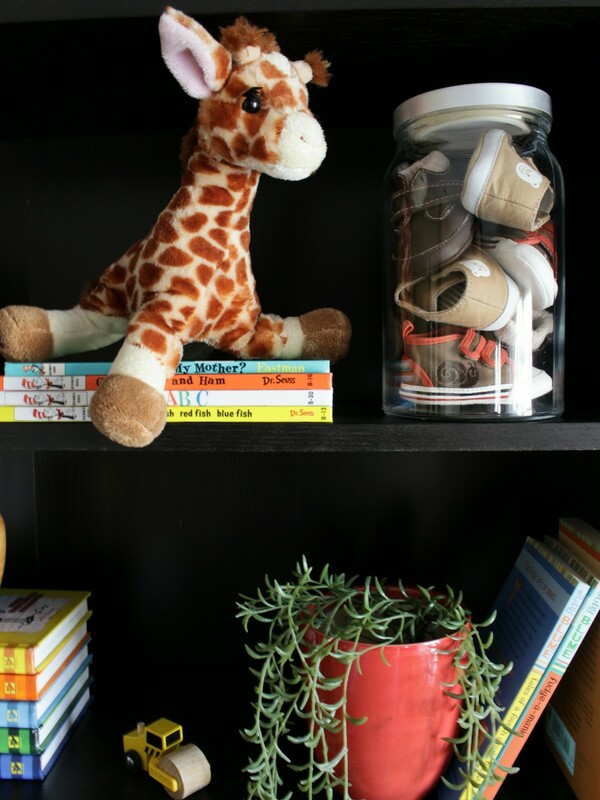 Adding decorative elements to your shelves is what will make them look their best. 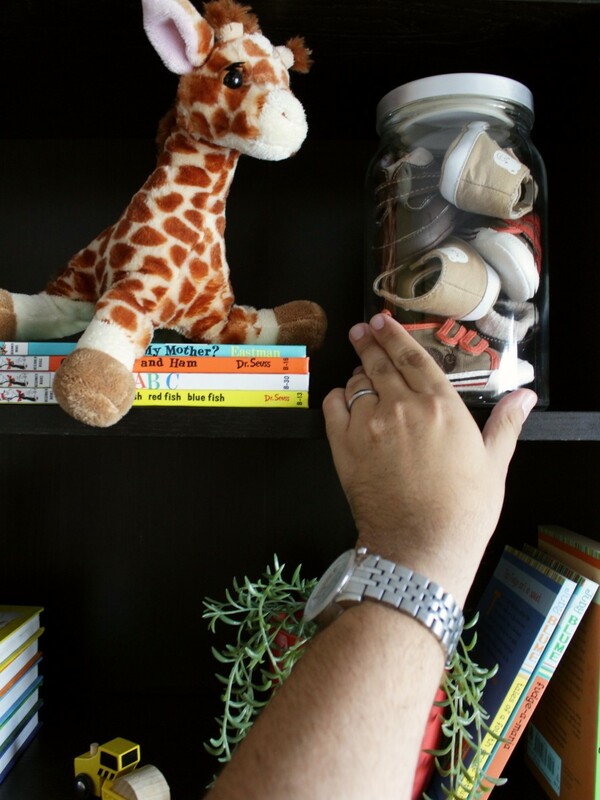 Place them beside the books or right on top of the stacks. a collection of my son's baby shoes displayed in a glass jar. 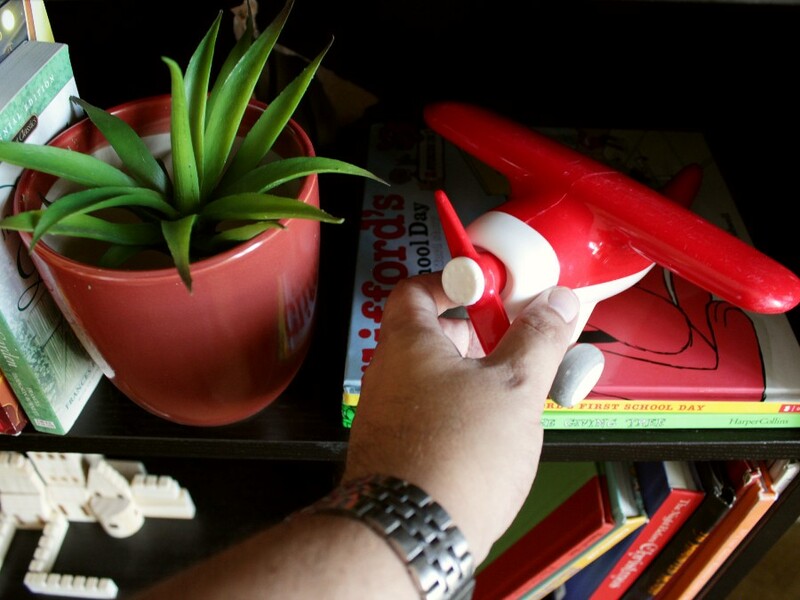 I used toys as decorative accessories for my son's shelf and it works for a kid's room. For a shelf in a living room or master bedroom, I would use a collection of pottery, or maybe large pieces of coral and shells; really anything can work as long as you stay within a color scheme that compliments the rest of the space's decor. the accessories help deter the eye from the big, black hole of a TV. Ahhh... seeing this shelf arranged and organized gives me such piece of mind... It really puts me i a good mood! 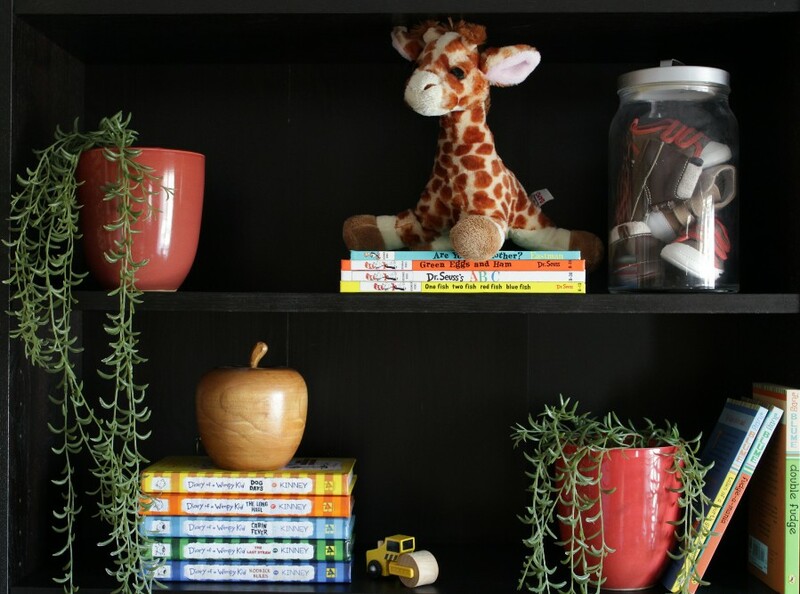 Don't hesitate to follow these steps to make your bookshelves look a bit better and harmonize with the rest of your home. 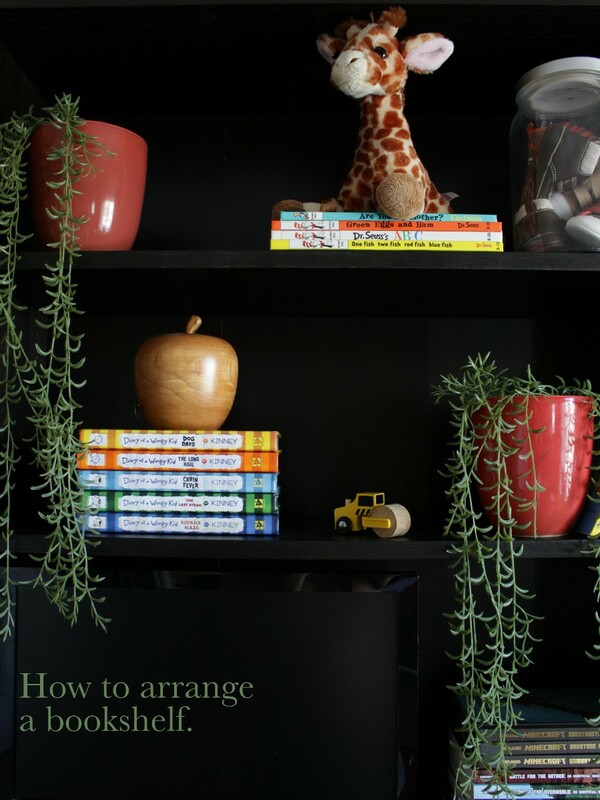 Just remember to zigzag your books, use nice bookends, add "greenery" and finish off with decorative elements. Easy! Oscar, great article, I just re-did my bookshelf, thank you!